As soon as the sun sets during the warm part of the year from much of southern Canada down to Central America, large White-lined Sphinx (Hyles lineata) moths will emerge, and like nocturnal hummingbirds, these amazing fliers can be seen zooming around the garden and hovering before flowers as they sip nectar. Occasionally, these hummingbird-like moths can even be seen during the daytime, especially late in the season. 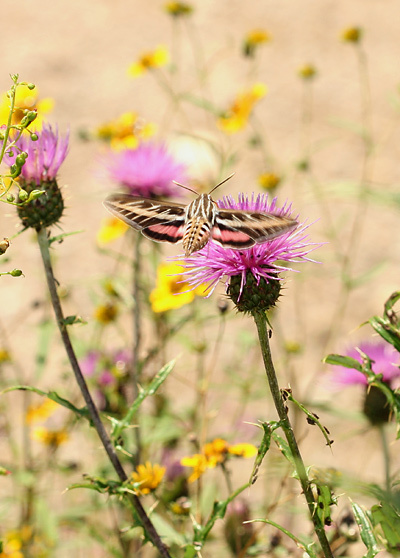 In September of 2006, I observed this White-lined Sphinx moth below visiting thistle flowers on the summit of Mt. Bigelow in Arizona's Santa Catalina Mountains. White-lined Sphinx moths are very common to occasionally abundant here in southeastern Arizona. In the fall of 2005, I observed an absolute bumper crop of fat White-lined Sphinx caterpillars munching on weeds (mainly Boerhavia spp. ), and as a result, the adult moths like this one below were abundant the following spring. These fast-flying moths are difficult to photograph in flight unless they are hovering before flowers and the light is good, but later in the evening, White-lined Sphinx moths can often be found resting near outside lights where they are much easier to observe and photograph. 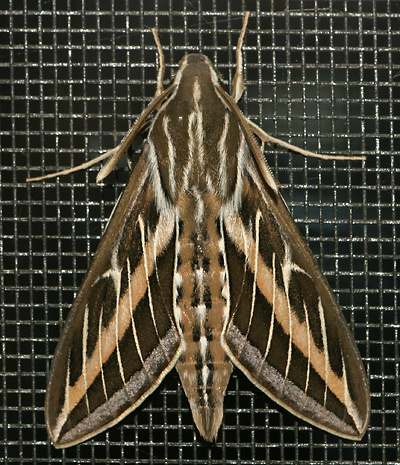 White-lined Sphinx moths can be recognized by their large size, large eyes, furry brown thorax with six white stripes, tan band down each forewing, row of white-lined veins across the forewings, and by their pink and black hindwings. 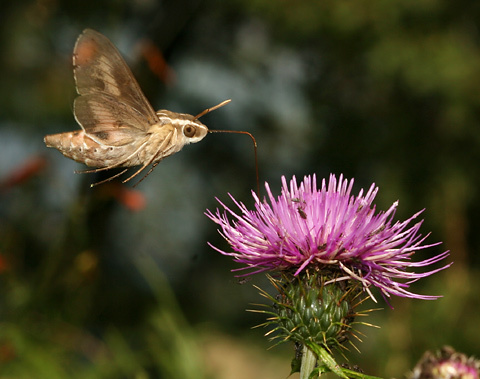 Unlike most butterflies with their relatively small, slender bodies, larger, broader wing surfaces, and resultantly slow and fluttering flight, White-lined Sphinx moths with their large, plump bodies and relatively smaller wing surfaces must beat their wings very fast in order to stay aloft. Although they are constructed very differently from hummingbirds, White-lined Sphinx moths are able to hover hummingbird-like in mid-air as they sip flower nectar due to their similarly rapidly beating wings. 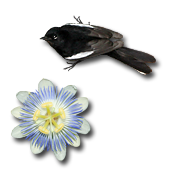 While hummingbirds prefer red flowers and other brightly colored, tubular flowers, nighttime White-lined Sphinx moths prefer white and other pale-colored, tubular flowers, which are much easier for them to see in the evening. 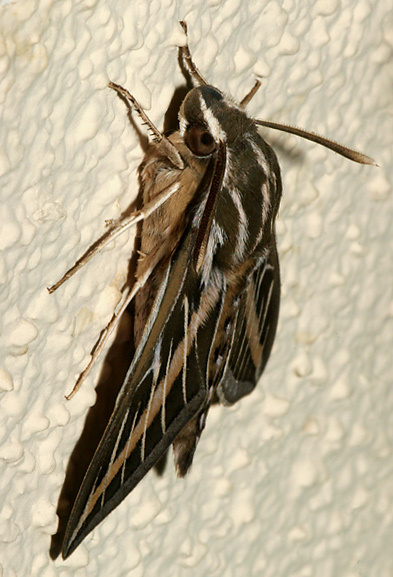 I've observed daytime White-lined Sphinx moths at a variety of flower colors, and the flower color preferences of these mainly nocturnal moths may differ from day to night.